Two of America’s greatest living filmmakers get the home video treatment they deserve with Criterion’s superlative Blu-ray edition of Joel and Ethan Coen’s 2013 masterpiece Inside Llewyn Davis. A portrait of folk music in Greenwich Village in the months (or, more accurately, hours) leading up to the arrival of Bob Dylan that would change the genre forever, Inside Llewyn Davis is one of the brothers’ richest and most original films. In it they've distilled their style to achieve the kind of purity their titular hero, played by Oscar Isaac, dreams of: the movie is straightforward and simple yet enigmatic and endlessly complex – like many Coen Brothers films, it gets exponentially better on repeat viewings. And there is no better way to revisit it than on this exquisite disc. 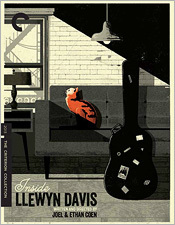 The story of Inside Llewyn Davis follows its title character as he struggles to scrape by in the New York folk scene of the early sixties, where he has notoriety but very little money; he spends his nights crashing on friends’ couches and his days dealing with the emotional wreckage left behind by his mistakes (like impregnating a friend’s wife) and the suicide of his one-time singing partner. His circular journey, made explicit by a simple but ingenious structural device the Coens use to frame the tale, yields a one-of-a-kind portrait of an artist filled with loathing – both of himself and others. Yet there’s no denying that he is a great artist, particularly since the filmmakers allow him to perform several songs practically without interruption (and recorded live – Isaac and the other actors perform all of the material themselves). The result is a melancholy musical that’s also very, very funny. The brutal winter landscape in which Llewyn finds himself is flawlessly captured on Criterion’s transfer, which recreates cinematographer Bruno Delbonnel’s chilly blue palette to perfection. Every aspect of the image, from color to contrast to grain, is expertly calibrated and on a par with anything Criterion has done. The same goes for the soundtrack, which allows the viewer (listener) to fully appreciate the majesty of music producer T Bone Burnett’s achievement in compiling a collection of classic folk songs and giving them new life through his arrangements, and through the extraordinary performances by the actors. Criterion supplies a wealth of extra features to enlighten the viewer on exactly how the Coens and their collaborators achieved their effects, with the emphasis here being on the creation and history of the folk music. There’s a fine behind-the-scenes documentary on the making of the movie and its music that provides a rare candid look at the Coens’ process, and its insights are expanded upon in a terrific interview with the brothers conducted by fellow filmmaker and fan Guillermo del Toro. From there the disc provides a feature-length documentary on a Llewyn Davis tribute concert that featured Joan Baez, Jack White and others, and an excellent interview with music historian Elijah Wald on the real-life context for the film. Add to that a conversation between Burnett and the Coens, a vintage documentary about a clash between folk singers and the police, and a commentary track featuring three more music historians (Robert Christgau, David Hajdu, and Sean Wilentz), and you’ve got both a crash course in folk music of the 1950s and 1960s and a flawless transfer of one of the best American films in recent years.